The Fascinating Woman Who Deserted the Pharaoh For the Arms of the Artist Who Made Her Immortal! A necessarily fictitious biography of the Queen famous for her beauty, and the sculptor who loved her. Altough much liberty is taken with history (in all fairness, there is still a great deal that is not known about this period) an interesting story has been concocted about the mysterious queen. 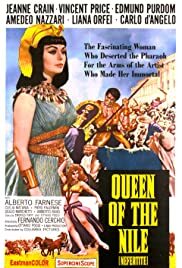 It seems the sculptor who made the famous bust was enamored of her before she became the royal wife and was a mere High Priest's daughter who was cruelly forced to marry Amenophis IV unconvincingly played by Amadeo Nazzari, who is not in the least like Ahkenaton. But the costumes and sets are gorgeous, and Miss Crain is lovely. Vincent Price is credible as the nasty priest of Amon-Ra.